We are more than a school. 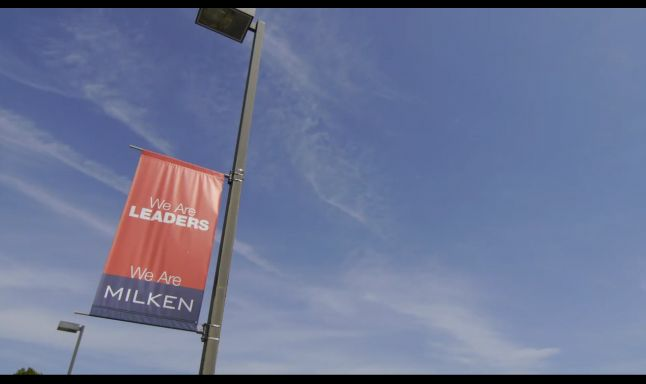 As a grade 7 - 12 independent college-preparatory institution, Milken Community Schools is a place of rigorous academic preparation and intellectual inquiry: a place of profound and transformative experiences, with learning, spiritual practice, and ethical practice at the foundation of those experiences. Milken's core programs drive a demanding and fulfilling academic curriculum. Our specialized institutes and centers, ranging from architecture and design to science and technology and advanced Jewish studies, in concert with advanced placement courses and a full array of performing arts, visual arts, and language electives provide our students with the finest private, independent school experiences infused with the best of Jewish education. Students at Milken learn that their education is not only an avenue to achieve their personal goals but also a place to develop a strong sense of responsibility for family, community, country, and the world. Our school strives to model not the world as it is, but the world as it should be. We invite you to use this website as a starting point for your exploration of the breadth of opportunities at Milken and a glimpse into our extraordinary community. 1981: Middle School was founded, located in a handful of dormitory rooms on the American Jewish University Campus (formerly the University of Judaism). 1990: Based on the success of the Middle School, the Upper School was founded. 1998: Upper School moves into permanent facility on Mulholland. 2009: Saperstein Middle School Campus opens adjacent to Upper School. Milken Faculty: Our faculty is drawn from various religious and cultural backgrounds. Approximately 70% hold advanced degrees. AP Course Offerings: Art History, Biology, Calculus AB, Calculus BC, Chemistry, Chinese Language and Culture, Computer Science A, English Language and Composition, English Literature and Composition, French Language and Culture, Latin, Microeconomics, Music Theory, Physics 1, Physics 2, Physics C, Psychology, Spanish Language and Culture, Statistics, Studio Art: Drawing, Studio Art: 2-D Design, United States Government and Politics, United States History, and World History. Proud partner of the Jewish Federation of Los Angeles.